Publisher: Thousand Oaks, Calif.: Corwin Press, c2010. 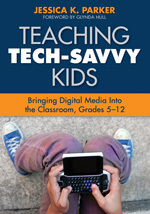 From the publisher: Students are plugged in, powered up, and connected. Are you? Digital media presents powerful tools for engaging students in developing critical thinking, collaboration, and other 21st-century skills. Written for middle and high school teachers, this resource explores the relationship between students and digital media and shows how to design learning opportunities that harness today’s technology. Teaching Tech-Savvy Kids shows how to integrate digital media into your classroom and create more engaged, student-centered learning opportunities. About the author: Jessica K. Parker is currently an assistant professor at Sonoma State University, and she studies how high schools integrate multimedia literacy into academic literacy learning. She has taught middle school, high school and college students for over a decade and has also created and taught professional development courses for teachers. She has published teacher-researcher articles in English Journal, and has presented at national conventions such as AERA, National Media Education Conference, NCTE Assembly for Research, and many others. Jessica completed her undergraduate and graduate work at the University of California, Berkeley; she has a B.A. in Media Studies and a M.A. and a Ph.D. in Education.